We are happy...full of energy...we are free to do what we like...going in the mountains. It is a hard trail...each day is long, technical, beautiful, with a lot of ascents and descends on wild and narrow paths. Is for you if you have a lot of experience and if you like challenges! Transfer from Bucharest airport to Zărnești. Zărneşti is the most important town for visiting the Piatra Craiului National Park. It is also an ideal starting point for approaches in the northern part of the massif. This town lies at a distance of 28 km from the city of Braşov, by road, bus or railway. From Zărneşti, an 11 km long road makes the connection with Plaiul Foii, which is a good starting point for climbing the ridge of Piatra Craiului ( part of Carpathian Mountains). Accommodation and dinner to a local guesthouse. The northern ridge of Piatra Craiului mountain. We have to climb first to Curmătura chalet. After the picnic lunch we'll start the real climbing to 2000m on a technical trail equipped with cables. Here we are in Turnu peak, the starting point of the ridge. We'll cross the ridge from north to south on a very narrow path with some technical parts which need all our attention. We'll overnight in a mountain refuge on the Grind saddle at 1900m. The southern ridge of Piatra Craiului mountain. Today we'll continue our crossing; the southern ridge is shorter but also with some technical parts and all the time the path is narrow and abyssal. The last peak is Funduri where we'll start our descending; this is less technical, the path leads us through grass and than through forests, meadows; we'll cross near some sheepfolders in our way back to civilization. 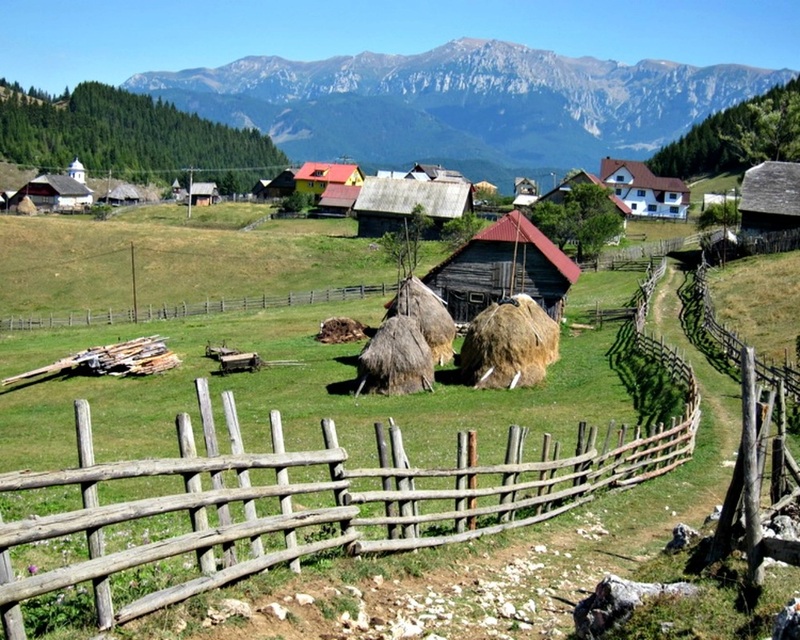 Overnight in a small, remote mountain village, named Măgura. The day begin with an uphill on Măgura saddle. We'll walk on a path which connect Măgura village with Bran. We descend to Bran where we visit the open-air village museum and Bran Castle better known like “Dracula” Castle. For many years the castle was home to Queen Marie, Queen Victoria of England’s granddaughter. Accommodation in a local eco-touristic guesthouse where hospitality and the joy of a simple life is part of this place. Bucegi mountains-Padina. We start walking on a forester road to approach the main climbing on the west side of Bucegi mountain. It will be a long and difficult one, from 700m to 2500m, but beautiful in the same time. Picnic lunch to Omu chalet, in the higest point of this mountain. The descending to Padina is fast and offer us a panorama with impressive surroundings. Overnight in a local guesthouse. Padina-Sinaia. We'll cross near the Bolboci lake, then we have to climb to 2000m high, above the Bucegi plateau. The descending to Sinaia is a steep one, which traverse a skislope, green forests and from where we can admire all the Prahova valley and Baiului mountains in front. Accommodation in Sinaia. Transfer to Bucharest airport. Prices for groups with 6 persons – 720 euro/person. We provide transfer from airport and back, luggage transfer each day on tour, qualified and experienced mountains guides, local accommodation with half board & picnic lunch, Sponser energy drinks and bars, T-shirt.